Phosphorus (P) is a multi-valent nonmetal chemical element of the VA group, No 15 of the Periodic System. Its molar mass is 30.97. Twenty-three isotopes of phosphorus are known, but only one of them is stable. Phosphorus is a highly reactive element. It reacts with oxygen, halogens, sulfur and many metals. Due to its high reactivity phosphorus cannot be found as a free element on Earth. The phosphorus atom contains five valence electrons on its outer layer. In compounds with metals and hydrogen, phosphorus exhibits an oxidation degree of –3, and in interaction with more electronegative elements, like oxygen, fluorine, etc., the oxidation degrees are +3 or +5. Phosphorus is characterized by allotropy. It forms several simple substances that differ in structure and properties. The most widely distributed are white and red phosphorus. The white phosphorus consists of P4 molecules. It is a white wax-like substance with a yellow tint that glows in the dark. The white phosphorus is not soluble in water but is soluble in carbon disulfide. It is poisonous. It is highly reactive and can ignite spontaneously. The red phosphorus has a crystal atomic lattice. It does not dissolve in water and carbon disulfide. It is not poisonous and has lower activity compared to the white phosphorus. The allotropic modifications of phosphorus are interconvertible. Phosphate is a chemical derivative of the phosphoric acid, containing the phosphate ion (PO3−4). The phosphate ion can form a variety of different salts. Formally, any salt of a phosphorus oxoacid is a phosphate. 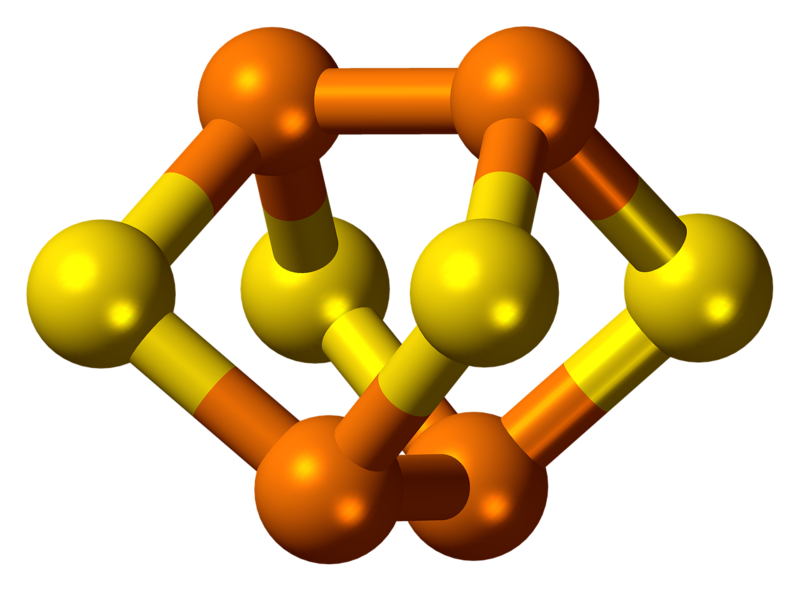 The phosphate ion is a polyatomic ion with a tetrahedral arrangement of the atoms. It consists of one phosphorus atom, located in the center and surrounded by four oxygen atoms. The molar mass of the phosphate ion is 94.97 g/mol. Depending on the number of the phosphorus atoms, phosphates can be divided into four major groups: orthophosphates, pyrophosphates, tripolyphosphates, and polyphosphates. Each of these groups has its own specific functional properties. 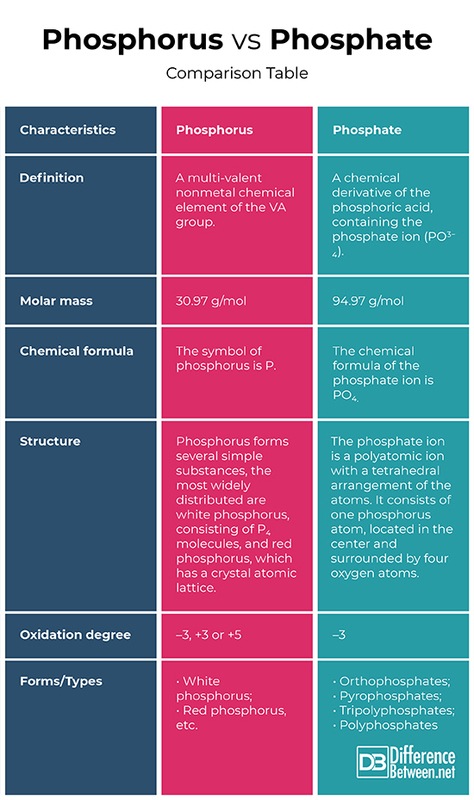 Phosphorus: Phosphorus is a multi-valent nonmetal chemical element of the VA group. Phosphate: Phosphate is a chemical derivative of the phosphoric acid, containing the phosphate ion (PO3−4). Formally, any salt of a phosphorus oxoacid is a phosphate. Phosphorus: The molar mass of the phosphorus is 30.97 g/mol. Phosphate: The molar mass of the phosphate ion is 94.97 g/mol. Phosphorus: The symbol of phosphorus is P.
Phosphate: The chemical formula of the phosphate ion is PO4. Phosphorus: Phosphorus forms several simple substances, the most widely distributed are white phosphorus, consisting of P4 molecules, and red phosphorus, which has a crystal atomic lattice. 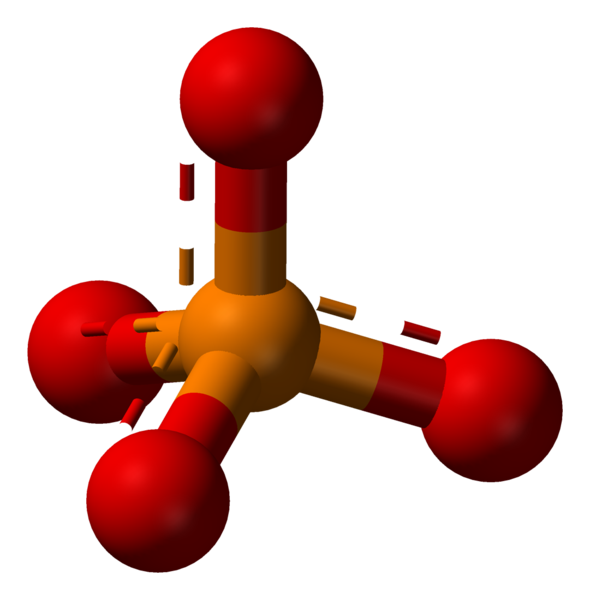 Phosphate: The phosphate ion is a polyatomic ion with a tetrahedral arrangement of the atoms. It consists of one phosphorus atom, located in the center and surrounded by four oxygen atoms. Phosphorus: In compounds with metals and hydrogen, phosphorus exhibits an oxidation degree of –3, and in interaction with more electronegative elements, like oxygen, fluorine, etc., the oxidation degree is +3 or +5. Phosphate: Phosphate exhibits an oxidation degree of –3. Phosphorus: Phosphorus is characterized by allotropy and forms several simple substances that differ in structure and properties. The most widely distributed are white and red phosphorus. Phosphate: Depending on the number of the phosphorus atoms, phosphates are orthophosphates, pyrophosphates, tripolyphosphates, and polyphosphates. Phosphorus is a multi-valent nonmetal chemical element of the VA group. Phosphate is a chemical derivative of the phosphoric acid, containing the phosphate ion (PO3−4). Formally, any salt of a phosphorus oxoacid is a phosphate. The molar mass of the phosphorus is 30.97 g/mol. The molar mass of the phosphate ion is 94.97 g/mol. The symbol of phosphorus is P. The chemical formula of the phosphate ion is PO4. The white phosphorus consists of P4 molecules, the red phosphorus has a crystal atomic lattice. The phosphate ion is a polyatomic ion with a tetrahedral arrangement of the atoms, consisting of one phosphorus atom, located in the center and surrounded by four oxygen atoms. Phosphorus exhibits an oxidation degree of –3, +3 or +5. Phosphate exhibits an oxidation degree of –3. Phosphorus forms several simple substances that differ in structure and properties, the most widely distributed are white and red phosphorus. Depending on the number of the phosphorus atoms, phosphates are orthophosphates, pyrophosphates, tripolyphosphates, and polyphosphates. Dr. Mariam Bozhilova Forest Research Institute, BAS. "Difference Between Phosphorus and Phosphate." DifferenceBetween.net. November 19, 2018 < http://www.differencebetween.net/science/difference-between-phosphorus-and-phosphate/ >. De, A. A Text Book of Inorganic Chemistry. New Delhi: New Age Publishers. 2003. Print. Housecroft, C., A. Sharpe. Inorganic Chemistry. London: Pearson Education Limited. 2012. Print. Lazarov, D. Inorganic Chemistry. Sofia: St. Kliment Ohridski. 1995. Print.